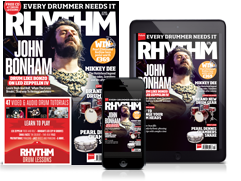 Whether you’re a beginner drummer looking for a cheap entry-level electronic drum set on which to learn songs and practice your rudiments, or a pro drummer needing a powerful, expressive and customisable e-kit for demoing, recording or playing live, the best Roland electronic drum kits offer something for every type of player. Roland launched its first V-Drums electronic kit, the TD-10, in 1997 and the company has since pioneered everything from mesh pads and realistic cymbals, to advanced behaviour modelling technology and hybrid functionality, to help bring the worlds of electronic and acoustic drumming closer together. At the budget end of things Roland offers compact and functional electronic drum sets with coaching aids to help new drummers grow, plus a range of quality sounds and reliable hardware. Further up the scale, Roland introduces deeper, more expressive sounds, advanced trigger technology, and huge customisation parameters, like the ability to digitally tweak the depth of a drum or the room it’s being played in. As always, the key benefits of playing electronic drums over an acoustic kit are the ability to play and practice quietly through headphones, having a range of sounds and features at your fingertips, plus a generally smaller footprint. 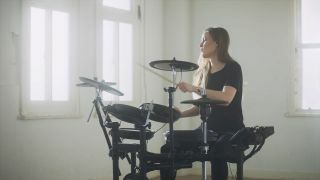 When searching for a new electronic drum set you will find multiple brands vying for your attention, with Roland, Yamaha and Alesis sitting at the top of the tree in terms of the product ranges, innovations and features on offer. If your Google searches read something along the lines of ‘Roland vs Yamaha electronic drum set’, then let us give you some clarity, starting with this comprehensive guide to the best Roland electronic drum kits available today. The compact Roland TD-1 is available in two guises - the TD-1K which includes four single-zone rubber tom and snare pads, choke-able dual-zone crash and ride cymbal pads, and a hi-hat pad - the TD1-KV swaps the snare pad for a more realistic-feeling mesh headed pad, complete with dual-zone triggering for the head/rim. Previous budget Roland kits have seen the hi-hat and bass drum pedals fixed to the stand, which restricts placement, but the TD-1's pedals are standalone, meaning they can be positioned where you like, and even upgraded at a later date. The TD-1 brain features 15 preset kits in varying styles, and while there is minimal adjustment for pad sensitivity and panning, the sounds are fixed; but if all you want to do is play, you can do so without getting bogged down in tinkering. The USB port also transmits MIDI, and can control high quality sound libraries like EZ Drummer and Superior Drummer perfectly. The on-board jam tracks and Rhythm Coach functions will be very welcome inclusions for those just starting out, too. The TD-1 is designed as a practice tool for beginners - a job it does very well - and comes in at a great pricepoint. This kit packs an 8" dual-zone mesh snare pad, three 6" single-zone mesh tom pads, three choke-able 10" dual-zone cymbal pads (hi-hat, ride and crash), a hi-hat controller pedal and a bass drum pad. The compact four-post rack is built around a narrow H-shaped central section and houses an in-built rubber bass drum trigger pad that’s wide enough to accommodate a double pedal. The TD-1 module has been around for a while but is packed with practice aids, some challenging coaching functions, plus quality backing tracks. Despite missing some bells and whistles, the module’s simplicity makes it incredibly user friendly, so it’s particularly well suited to beginner or younger drummers. The 15 kit presets on-board are varied in style and provide a usable selection of sounds that cater for many styles of music. The two-ply mesh heads respond well and the dynamic range afforded by the module is commendable - from a gentle, open bass note through to the hard attacking slap of a bass drum head. The dual-zone snare also allows rim-shots for further expression. The dual-zone cymbals help in broadening the tonal horizons and maximising options within this compact setup. What makes this set-up different from the rest is the unique rack design which allows it to fold down to around half its playable size - small enough to stash in a cupboard/corner of the bedroom or, for a gig or rehearsals in between passengers on the back seat in a small car. Playing the kit for only a short while, the compact footprint and pad positioning feels surprisingly natural to play and the four mesh-headed tom and snare pads feel great. The TD-1KPX2 also features a wider kick pad to accommodate single or double bass pedals. The partnered module comes with 15 pre-programmed kits. The interface is fairly basic but, as a result, is also incredibly intuitive. The kits comprise a mixture of live and recording sets, electronic sounds and a choice of percussion. There are a range of 15 onboard songs to play along with and the module provides a mix-in jack to input your favourite audio source and jam with. Aside from the compact design and mesh pads, one of the best features is the module's 10 coaching features, designed to help you improve everything from tempo to technique. Roland’s TD-17 is available in three configurations, but our top pick is the top KVX model, which includes all-mesh pads (including a newly-designed PDX-12 snare pad with raised rim for a more acoustic feel) and the awesome one-piece VH-10 hi-hats which mount to a conventional stand. The quality of sounds on the TD-17 module is striking and Roland’s processing gives players plenty of tweak-ability to the base sounds. Selecting a voice and making tonal changes is scarily intuitive. It’s all laid out and labelled clearly along with dedicated switches for common functions such as tuning, muffling, ambience, EQ and volume levels. When it comes to loading samples into the TD-17 module the process is undeniably easy. 16-bit, stereo or mono, you can throw wav samples onto an SD card and load them into the TD-17’s pool of 100 user sound slots. From this point, you assign it in the same way as any other sound, by hitting the pad and then scrolling through. The jewel in the TD-17KVX’s crown is the ability to effortlessly pair a smart device via Bluetooth and jam along with Spotify. The outlay is a big investment, but the level of sound quality, features and playability sets a new benchmark for those looking for V-Drums they won't outgrow in a hurry. The basic principle of the TD-25KV is to supply the end user with fewer but better quality sounds, making it easier and more appealing to play. The kit includes Roland's 10" PDX-100 snare pad and 10" floor tom pads, with a pair of PD-85 pads for the rack toms, plus you get a ride and two crash cymbals. The kit uses a 'proper' VH-11 hi-hat trigger, mountable to a real mechanical hi-hat stand, as well as the cloth-headed KD-9 bass drum pad. Inside the stripped back module are 18 kits, categorised by six different styles and making use of Roland's SuperNATURAL behaviour modelling, which makes the kit more adaptive to your playing. Sounds are split into categories; 'Standard' offers studio-style kits that are fairly genre-agnostic, leaning towards the studio/pop side of things, while the other genres speak for themselves. Each one is accessed via a main rotary control. A mixture of a lot of sensors, a lot of samples and some clever switching combine to ensure the response to your playing is super accurate and dynamic, and the addition of audio recording and playback via USB stick makes capturing ideas for songs, recording a performance to a jam track or just playing along to your favourite tunes much easier. If you simply want to plug in and play in a responsive and realistic way, the TD-25KV is hard to beat. The KV is supplied with a 10" mesh rack tom pad and two 12" floor toms. It also includes Roland’s groundbreaking and sensor-packed digital snare and ride, which plug into the module via USB and bring not only an extended range of dynamics, but also a more familiar, acoustic feel to the table. Rounding out the package is a crash, crash/ride, hi-hats and a bass drum pad. It’s also worth considering an upgrade to the KD-A22 bass drum, a triggered mesh pad system which replaces the batter head of your existing 22" acoustic bass drum. The module itself utilises Roland’s Prismatic Sound Modelling technology, which helps recreate every last dynamic of your performance, plus a powerful processor which manages neat features like importing your own samples via the in-built SD card slot. The SD slot can also be used to play full tracks or loops. It’s then possible to record a drum take to your chosen track, which is automatically saved to the external card ready to be exported as MIDI. Huge kit customisation options include shell depth, head and muffling, microphone positioning, cymbal size/thickness and even ping level/type. For a kit at this level Roland hasn’t failed to deliver with the endlessly customisable TD-50. It’s absolutely brimming with features and edges ever closer to the realism of an acoustic kit.